The Interop networking extravaganza kicks off next week in Las Vegas, and Hewlett-Packard's Networking division is trying to get a jump on all of the chatter by previewing its latest FlexFabric fixed and modular switches as well as rolling out a new carrier-grade physical router and a virtual one. The first new box that HP is showing off its FlexFabric Virtual Switch 5900v, which marries a 5900AF physical switch with a virtual switch for linking to server virtualization hypervisors. Kash Shaikh, senior director of product and technical marketing at HP Networking, says this has more advanced capabilities than a virtual switch from VMware and, more importantly if you are HP, has hooks into the company's own IMC network control freak. At the moment HP only supports VMware's ESXi hypervisor with the 5900v virtual switch, but Shaikh tells El Reg that this virtual switch will eventually plug into Microsoft Hyper-V, Citrix Systems Xen, and Red Hat KVM hypervisors. The FlexFabric Virtual Switch 5900v is not going to be available until the fourth quarter, so HP has time to hook it into other hypervisors. Pricing has not been set yet for it. 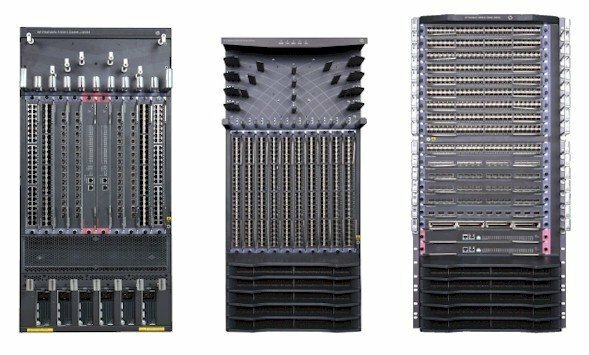 At the other end of the spectrum, there are three new FlexFabric modular switches to act as the core and access layers of the network. The FlexFabric 11900 is a Layer 2/3 aggregation switch that supports Ethernet ports running at 10Gb/sec or 40Gb/sec, depending on the linecards you slide into the 20U chassis, and HP is very excited about the fact that it is the first such switch to support the OpenFlow 1.3 protocol as well as a bunch of other features such as Transparent Interconnection of Lots of Links (TRILL), Shortest Path Bridging (SPB), and Intelligent Resilient Framework (IRF). The SPB support will not be ready until the first quarter of next year, if you read the fine print in the spec sheet. OpenFlow allows an external controller to configure the control plane in switches and routers, allow you to create network applications that can automagically (and out of band) reconfigure network settings in these devices on the fly. The 11900 mod box has a total of 7.7Tb/sec of switching capacity and uses a mix of HP and third-party ASICs (Shaikh didn't want to name names) and can handle 5.7 billion packets per second. The port-to-port hop latency can be as low as 3 microseconds, which is about as good as it gets out there right now in network world. The switch can have up to 384 10Gb/sec ports or 64 40Gb/sec ports, or a mix of the two. The machine has about half the latency of the Nexus 7010 switch from Cisco using F2 modules and offers about a third the cost per port and a third better density with 40Gb/sec ports than equivalent Cisco gear, according to Shaikh. HP will start shipping the FlexFabric 11900 switch at the end of June; prices start at $83,000 for a base configuration. The 12910 has ten linecards and the 12916 has sixteen linecards, as the name suggests, and the top-end box delivers 36Tb/sec of switching bandwidth and sports up to 768 10Gb/sec or 256 40Gb/sec Ethernet ports. Shaikh says that this is twice the switching capacity of Cisco's Nexus 7018 using its F2 modules and three times to 40Gb/sec port density of the Cisco Nexus 7010 switch using M2 modules. The two FlexFabric 12900 series core switches will be available this October, and pricing will be set then. On the routing front, HP has a new HSR 6800 series router, which bundles together routing, firewall, and virtual private networking functions. The router has a 2Tb/sec backplane that can handle 420 million packets per second of routing throughput. The machine sports 32 ports running at 10Gb/sec speeds across its eight linecards and will be upgradeable to 40Gb/sec and 100Gb/sec speeds at some point in the future. 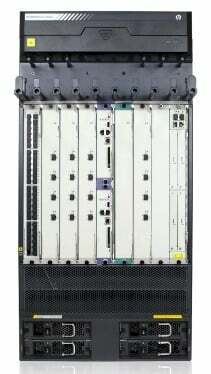 HP says that the HSR 6808 has up to seven times the routing performance of the Cisco ASR 1000 router, with five times the firewall scaling and three times the VPN throughput. The HSR 6800 is available now, at a base list price of $46,000. If you want to plunk routing functions onto the public cloud, then HP has a Virtual Services Router it wants to show you at Interop. The Virtual Services Router runs atop the Comware 7 network operating system and is the same code as is used in other HP routers (specifically, the HSR 6800 mentioned above), and it runs atop VMware's ESXi hypervisor today with support for Red Hat's KVM coming shortly. You can plunk it onto any x86 server that supports those hypervisors and, if you are a service provider, give customers their own routing functions on the public cloud without having to give them a physical router each.